Adenomas of the liver are benign tumours of liver cells. They occur in younger patients. Most are asymptomatic and found by chance at the time of a scan. They can be difficult to characterise from other benign liver lesions especially focal nodular hyperplasia. Occasionally they can be complicated by bleeding either spontaneously or following minor trauma. The risk of evolution to hepatocellular carcinoma (primary liver cancer) is small but nevertheless present. 1 - The patient developed pain in the right upper abdomen and became shocked immediately after delivery of her first child. An abdominal ultrasound scan suggested a bleed into the right liver. A CT scan showed a large bleed into the right hemi-liver. 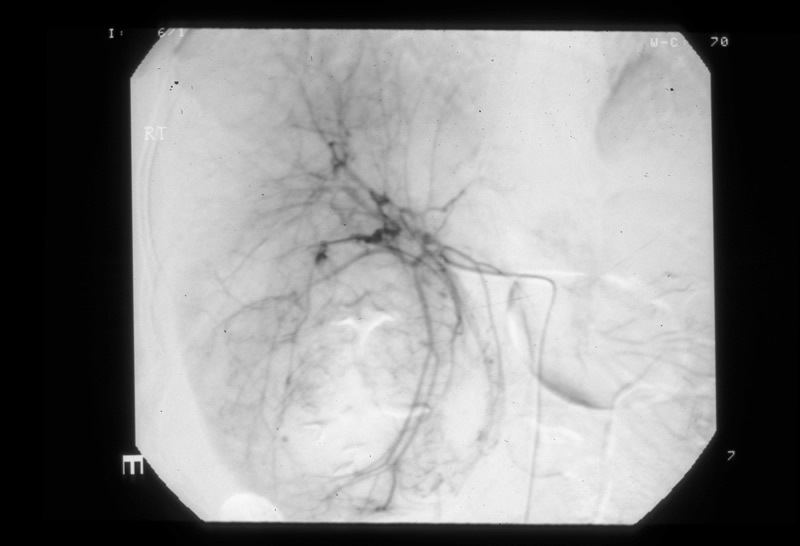 An angiogram showed that the branches of the right hepatic artery were splayed and attenuated within the right hemi-liver, particularly inferiorly. 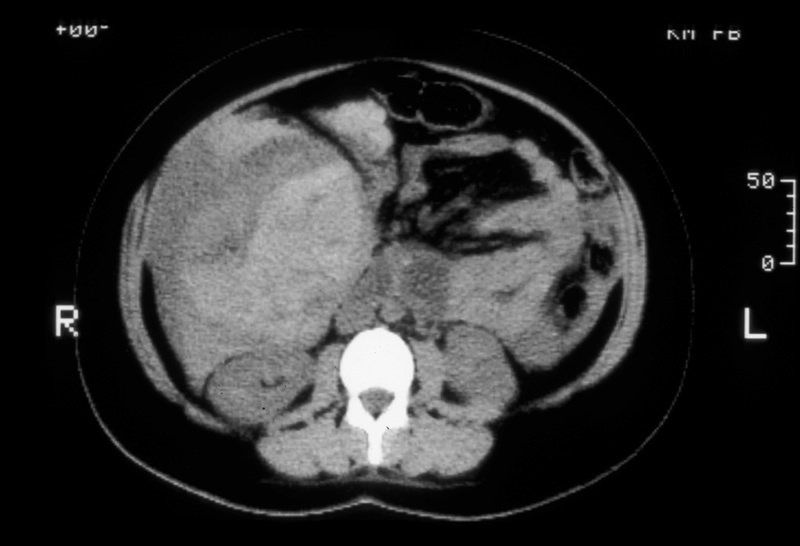 Selective angiography of the right hepatic artery showed that segments 7 and 8 were well filled but the vessels to segments 5 and 6 were poorly filled due to haematoma. 2 - The patient's bleeding was stopped by selective embolisation of the right hepatic artery using metal coils. 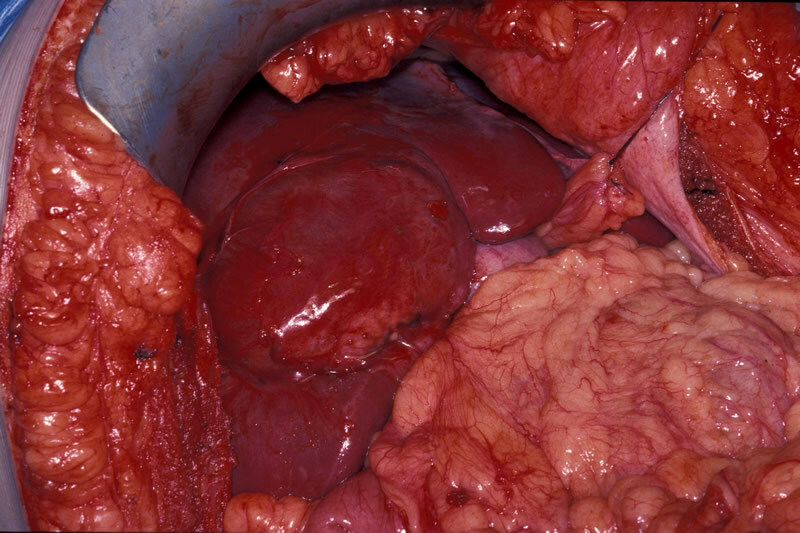 3 - A residual abnormality in segments 5 and 6 of the right hemi-liver was removed several months later. 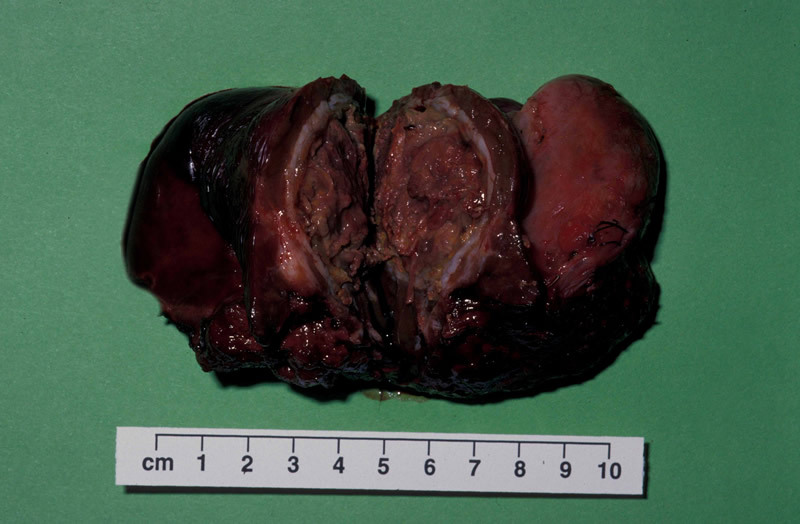 4 - The final pathology confirmed the underlying abnormality to have been an hepatic adenoma.